The Project Oasis team of the Junior Chamber International (JCI) – Manila Chapter will hold a Wine & Cheese Tasting and Workshop to be held at the Wack Wack Golf & Country Club in Mandaluyong City on May 19, 2011 from 6:30pm to 9:30pm. This event is for the benefit of the children in Smokey Mountain. For a minimal amount of just PhP500, participants of the event can learn from wine experts from Sommelier Selections. There will be three (3) batches for the workshop, which will teach everyone how to taste, serve and store wine. Guests can try a variety of wines and cheeses at the event and learn how to pair wine with food, as well as recognize the different grape varieties. The wines that will be featured are not commercial wines, but are only traditional, organic wines from private first-class vineyards. A dinner buffet will also be served throughout the evening. The organizers will be using the proceeds generated from this event for their project to build a park and playground in Smokey Mountain. During the evening, there will be a short performance from a choir of 15 children from Smokey Mountain, as well as a pledge drive to help promote their cause. In addition, for every bottle of wine purchased, half of the profits will be donated to Project Oasis. It is the goal of the group to convert a 1,000 square meter area of Smokey Mountain into a beautiful and clean environment for the children of Smokey Mountain to play in, while also encouraging them to develop their social and motor skills, stay away from gangs, and simply enjoy their youth. 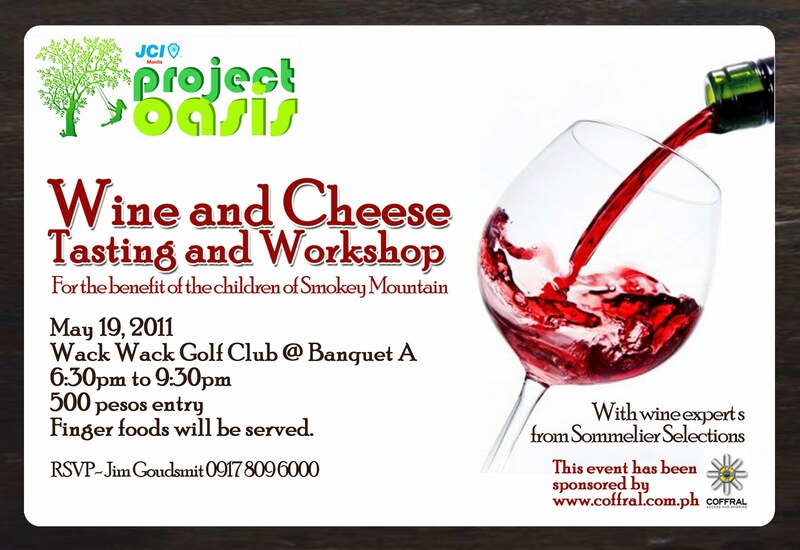 Project Oasis, along with JCI Manila, would like to invite everyone to join this event, learn a thing or two about wine, meet new friends, and most important of all, help out in a worthy and noble cause in uplifting the lives of the children in Smokey Mountain! The JCI (formerly known as the "Jaycees"), is a global network of young active citizens, with over 200,000 active members and millions of JCI alumni participating in projects, meetings, learning programs and events in more than 6,000 communities located in more than 100 countries throughout the world. They believe in the advancement of the global community and the creation of positive change by improving ourselves and the world around us. JCI Manila has had several successful projects in Smokey Mountain. The organization’s most famous project to date, The Field of Dreams, that gained recognition from several international and local awarding bodies and has garnered international and local media attention as well. Project Oasis aims to build off the success of The Field of Dreams and provide the community of Smokey Mountain with an innovative project that addresses a number of the many needs of its children. For more information, visit JCI Manila website. If you would like more information about Project Oasis, you may call Ryan Perez at +63.917.8139490 or (632) 216-4115, or email him at johnnyryan.perez@gmail.com.